When you follow us on twitter, you’ll receive up-to-date information on military divorce, the USFSPA, and former military spouse issues. Twitter is in the moment. In many ways, Twitter is faster communication than Facebook, so it works well to quickly send information into the community. Facebook posts last a little longer than Twitter. They are less likely to be buried in a feed. Currently, our articles are set to automatically post to Twitter, so if you want immediate notification of divorce or USFSPA issues, you should be following us on Twitter. How is Twitter different from Facebook? Twitter is a miniblog focused on “in the minute” news, so by following us there, you’ll receive quick short updates on immediate issues related to divorce, the USFSPA, military spouses, entrepreneurs, tips for divorced parents – everything we talk about – but in brief. Then you can click through to read full articles that interest you. Twitter also has the Retweet and Reply features. 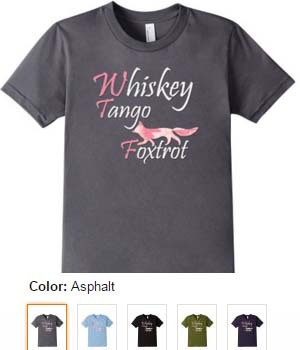 When Former Military Spouse follows you, we can Retweet YOUR twitter posts to our audience. In addition, the Reply feature of twitter allows us to have short conversations with you. Twitter also uses the “#” symbol to track discussions. 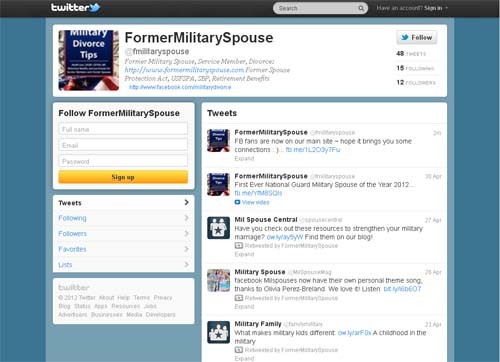 For example, if we tweet a post with #militarydivorce in it, you can search twitter and join in our conversation. To be 100% sure you receive EVERY blog post, you need to Subscribe to the Former Military Spouse Blog.